If you’ve recently tried to get your first job, you may know something about the furious catch-22 involved. How are you supposed to get experience if you need experience to get it? There’s a little of that in getting your first major league job. Go out there kid, don’t worry about those major league pitchers, and the crowd, just be comfortable. We’ll talk about whether or not you start tomorrow, tomorrow. Sounds like a recipe for pressing. And if you talk to Corey Dickerson and Charlie Blackmon, the remedy is simple: a more defined role. Which comes after success, mostly. Round and round we go. Of course, there were some adjustments that the players made. They weren’t necessarily mechanical, though. Confidence has allowed Blackmon to rely more on his instincts — “I can go based on what my gut feel is a lot more now,” he said. Dickerson has always tinkered with his stance, just based on what feels right. “I adjust all the time. I might have a different stance one day, I might not stride one day. I’m a feel guy, that goes with what’s comfortable and working,” he said of his swing. 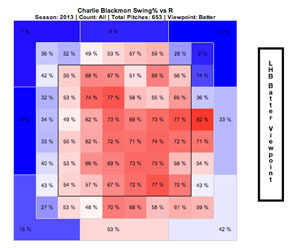 It’s really important for Blackmon to choose the correct pitch to swing at, even more important than for other players. 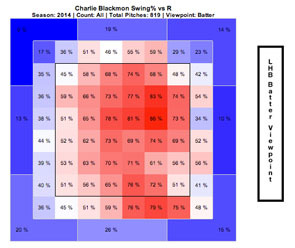 Blackmon’s swinging strike rate is top thirty in baseball, and just like Marco Scutaro pointed out, if you swing at the wrong pitch and have good contact ability, your plate appearance might be over with a thud. “Sometimes I get mad at myself for going up there and swinging at a nasty pitch and instead of swinging through it and missing and being 0-1, and living for another day, I get a ground ball, put it in play, and make an out,” Blackmon said. To some extent, both players have a skill that’s uniquely useful for their home park. Coors field inflates batting average on balls in play as much as than anything, and these guys can put the ball in play to all fields. Sounds so simple that way. We hoped you liked reading Two Young Colorado Outfielders Benefitting From Success by Eno Sarris!